In just over half a century, plastics have become pervasive throughout the economy due to their versatility and cost-effectiveness, growing their production volumes twenty-fold. Yet alongside clear benefits, today’s plastics system has significant drawbacks. A report released last year, The New Plastics Economy: Rethinking the future of plastics by the World Economic Forum, Ellen MacArthur Foundation and McKinsey & Co., found that today only 14% of plastic packaging is collected for recycling globally; the rest of it is either incinerated, landfilled or ends up as litter, often in the ocean. If current trends continue, by 2050 our oceans could contain more plastics than fish , by weight. Now, just one year after publication of this research, more than 40 business and government leaders have endorsed an action plan that could increase reuse and recycling rates for plastic packaging to 70%. Over 20% of plastic packaging could be profitably re-used - for example, by replacing single-use plastic bags with re-usable alternatives. Many countries have introduced a small charge for the bags incentivising re-use. This has often led to large decreases in single-use plastic bag use - for example, in the UK a 5p charge led to an 85% reduction. Countries such as Rwanda have gone one step further, banning plastic bags completely. Businesses are also starting to capture other re-use opportunities. For example, many products we use every day such as home cleaning products and liquid soap currently come in single-use bottles and consist mainly of water with a small volume of ‘active ingredients’. Australian company Splosh provides customers with refills in dissolvable sachets, that they can mix with water in a refillable bottle at home. Innovative ways of delivering products to customers such as this could produce 80%-90% packaging material savings and 25%-50% packaging cost savings, benefiting both businesses and customers. More than 40 years since the introduction of the universal recycling symbol, just 14% of plastic packaging makes its way to recycling plants globally - and after processing losses, only 10% effectively gets recycled. 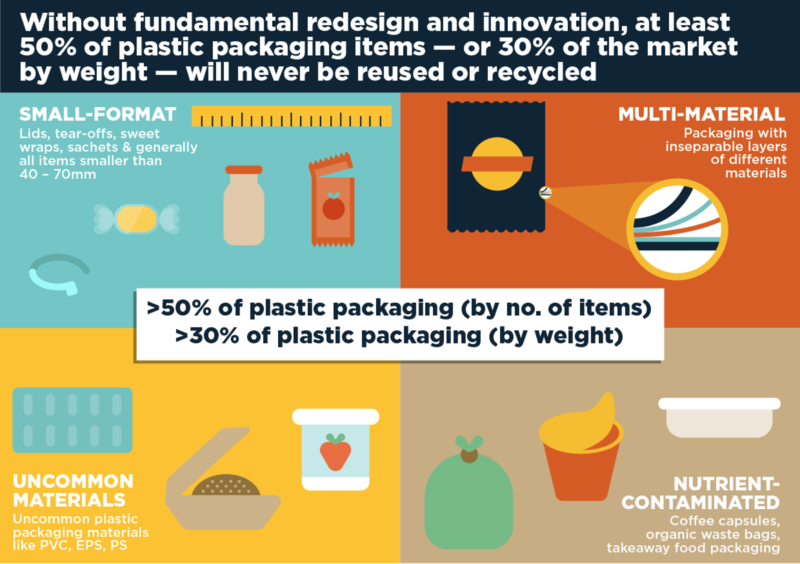 If improvements were made both to packaging design and to the systems for managing plastic packaging after use, 50% of plastic packaging could be profitably recycled. The choice of materials, colours, formats and other design factors all affect the ease and cost-effectiveness with which plastic packaging can be recycled. Relatively small changes can make a dramatic difference: for example, drinks bottles made of clear PET, such as those used for bottled water, are much easier to recycle than opaque PET bottles of which about 5,000-6,000 tonnes are sold in France alone each year, adding an estimated $1-2 million per year to the cost of recycling them. 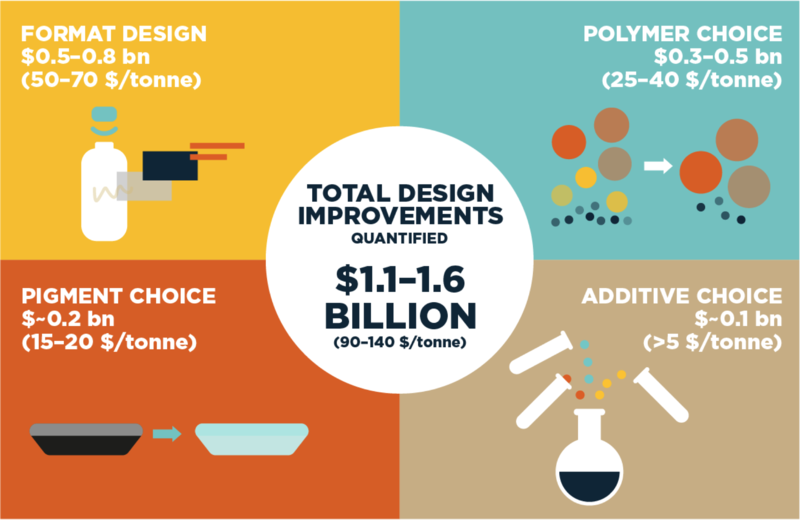 Purpose-designed packaging in conjunction with improved collection, sorting and reprocessing technologies could drastically improve the economics of plastic packaging recycling. At the same time urgent action is needed to deploy and improve basic collection and management infrastructure, particularly in regions with a high risk of plastic packaging ending up in the environment, such as South-East Asia. The greatest challenge lies with the 30% of plastic packaging (by weight), equivalent to 10 billion garbage bags per year, which will never be re-used or recycled without fundamental redesign and innovation. These everyday items, such as sweet wrappers, sachets and fast food packaging cannot be recycled and make up approximately half of all plastic packaging by number of items. They are today – by design –destined for landfill or incineration after a single short use, often with the risk that they will leak into the environment as litter. Fundamental redesign and innovation are required to make these types of packaging viable for re-use or recycling. Action is needed, for small formats, to redesign the packaging itself and/or the way it is used, so that it is less likely to leak out of collection systems. Beverage cans are a good example of the potential of redesign. The tear-off tab, being a small-format item, was difficult to collect and prone to becoming litter, until it was replaced in the 1970s by the stay-on tab that is prevalent today. 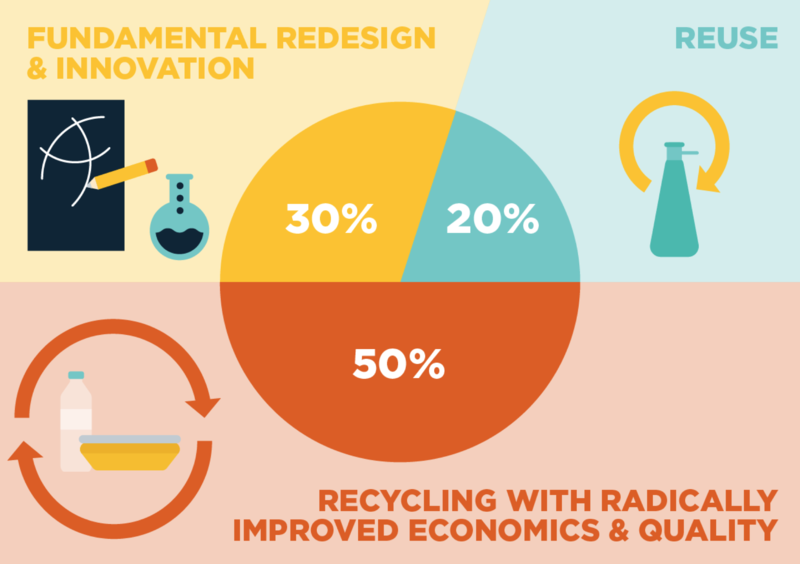 Uncommon materials often have very low recycling rates, less than 5% in the case of PVC; replacing them with more recyclable materials (while allowing for innovation) would clearly improve recycling rates. For packaging with remnants of food and other waste such as coffee capsules or fast food packaging, the priority would be to scale up the use of compostable packaging and related infrastructure. For multi-material packaging, like cartons and crisp packets, action is needed to boost innovation in alternative materials and reprocessing technologies. The action plan is presented in a new report The New Plastics Economy: Catalysing Action launched this week by the World Economic Forum and the Ellen MacArthur Foundation at the Forum’s Annual Meeting in Davos. 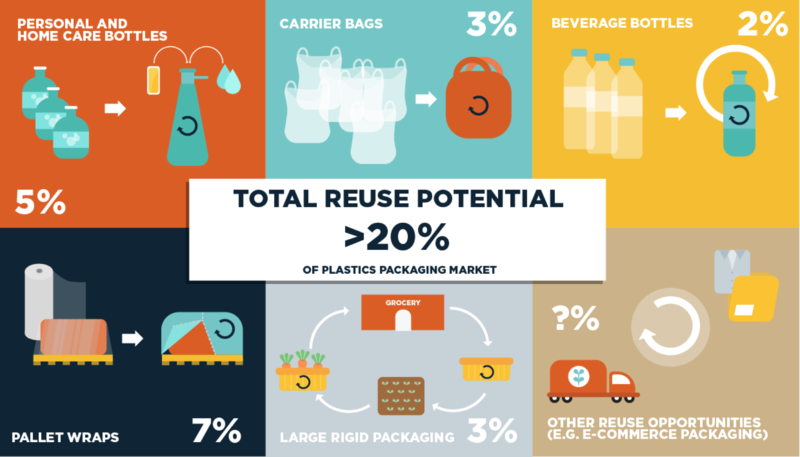 The research was produced as part of the New Plastics Economy initiative , established in May 2016 as a direct result of Project MainStream, a multi-industry, CEO-led collaboration led by the World Economic Forum and the Ellen MacArthur Foundation. The New Plastics Economy initiative is led by the Ellen MacArthur Foundation and brings together 40 leading organisations representing the entire global plastics industry, including Core Partners Amcor, The Coca-Cola Company, Danone, MARS, Novamont, Unilever, and Veolia, to work together towards a more effective global plastics system. The focus of the New Plastics Economy over the next year will be on bringing about wide scale innovation. The initiative will launch two global innovation challenges to kick-start the redesign of materials and packaging formats, and begin building a set of global common standards (a ‘Global Plastics Protocol’) for packaging design, concentrating initially on the most impactful changes. It will also improve recycling systems by delivering collaborative projects between participant companies and cities. To support the shift to “circular” design thinking and systems perspectives and to inspire innovators, entrepreneurs and designers, the Ellen MacArthur Foundation and IDEO are launching a new, publicly available Circular Design Guide , at Davos in January 2017. Note: The New Plastics Economy initiative is supported by Wendy Schmidt, through The Eric and Wendy Schmidt Fund for Strategic Innovation, as Lead Philanthropic Partner, and MAVA Foundation, Oak Foundation, and players of People’s Postcode Lottery (GB), as Philanthropic Funders.